Reports from Siberia, Russia, By Sawapop Tuamsang. Our journey started off by traveling to Dubai to connect a chartered flight to Khanty-Mansiysk, Russia. The flight took some 6 hours. We arrived at the city of Doha around midnight. However, we couldn’t get out of the airport and therefore had to spend nearly 10 hours doing virtually nothing here. It was quite torturous, so to speak. After having ‘rested’ on tiny chairs at the airport for ages, we finally moved on to board a chartered flight to Siberia. 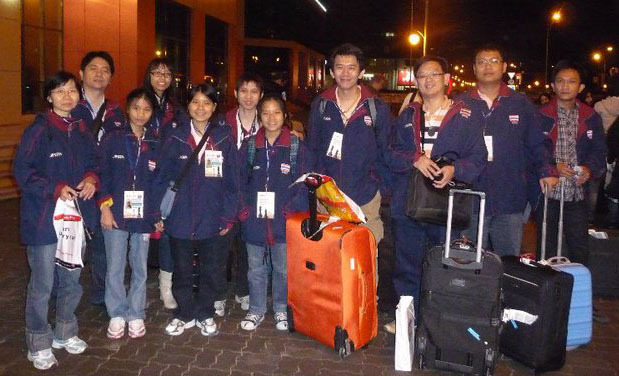 While waiting to get aboard, we met the Taiwanese Team. Some of them readily and, if you ask me, gracefully, came to greet us as they knew many Thai players, me included. One of them was Elsa Yueh, who once played in the 9th Bangkok Chess Club Tournament in Pattaya two years ago. Around 5-6 hours later we landed at Khanty-Mansiysk. We were all surprised of the weather here as it was not so cold as we had expected. The Thai Team was greeted by a somewhat friendly liaison officer named Dudza, or something. We were then taken to the hotel which was constructed for this event specifically. I stayed with Atippat. Despite of what had been much criticized about the hotels for players before we got here, I was pretty impressed with the facilities provided in the hotel room, though. Nothing was doing today. Some of us therefore went to inspect the city and shopping malls. The malls here were not big really, fairly small I would say. In the evening we watched the Opening Ceremony. I must say that it was a wonderfully spectacular extravaganza. 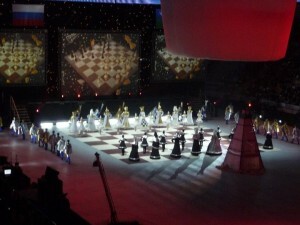 I had never seen any chess opening ceremony as big and colourful as this one before. It was very impressive. After the show was over, I spotted Kramnik being surrounded by hundreds of fans queuing up to take photos with him. At first, I wanted to have a photo session with him too, but later changed my mind as there were too many people. When we arrived at the hotel, we were told of the pairings of the first round. The Male Team was paired against the mighty Georgia, while the Female Team was pitted against equally tough opponents from Norway. It wouldn’t be a surprise if we did get beaten by 8-0. Of course, I would love to see our teams win or at least get some points. Then again, one needs to be so truthful to himself. After days of travelling, the moment of truth finally came. The results were not really surprising: 8-0. Jirapak finished his game first. He appeared to have been caught off in the opening, and, likewise, got beaten fairly quickly. Wisuwat was the next casualty, followed by Atippat. Uaychai on the other hand had a chance to get a draw, but in the end couldn’t manage anything out of it and eventually lost the game. As for the Girls Team, there was one board of Chanida which could be a draw. But with her inexperience in rook ending with equal pawns, she soon lost a pawn and was later technically crushed by the much experienced Norwegian player. The pairings for tomorrow: The Male Team met Tajikistan and the Girls Team played against Bolivia. In the 2nd Round, the Male Team got good results beyond expectations, as we could manage to draw 2-2 with the somewhat superior Tajikistan Team, although the first two boards were flatly defeated. Atippat had no chance against GM Amonatov Farrukh (2602). Jirapak however had fallen ill before the game started and this might be the reason why he made some blunders and lost the game in the end, amid nice combination of attacks from his strong opponent IM Isaev Jamshed (2382). Wisuwat applied his skills to the full extent before finally notching the first full point for the Thai Team, beating the weakest player of the Tajkistan Team, Khouseinov Rashid (2364). Uaychai played moderately but somehow checkmated his FM opponent, Djuraev Sokhib (2397), in the middle of the board! The Girls lost again, but, there was a surprise result with Nong Mo [Ruja Phitchayarom] who beat her opponent Ramirez M Eugenia whose rating was 2031! As such, she was the first ever Thai girl in history to have won a point at a chess Olympiad. Next rounds we would be playing Ghana for the Male Team, while the Girls would entertain Netherlands Antilles. Score today: 2-2 for the Male Team and 1-3 for the Girls Team. Today was my day! I was assigned to play my first ever Chess Olympiad game. I must admit that I was very nervous, despite the fact that I would be playing against an opponent whose rating was lower than me. When the game started, I therefore chose the safest path because I didn’t want to get zero point at this tournament. Likewise, it was not at all surprising that my game ended in a draw, with me having consumed almost all of the allotted time. All other teammates of mine won their games comfortably. The Girls also did well enough to win 3 games with 1 loss at Board 1 played by Chanida. Today was Sahapol’s birthday and he took us all to celebrate his new age at a seafood restaurant. The Malaysian Team also got invited as they were pretty close friends of ours. It was a fun-filled party. And there were no better gifts to our Manager than the sweet victories of our both teams today. The food was delicious. They also had lobsters here. Returning to the hotel, we learnt of the next round parings. The Male Team would play Canada, which seemed to be a very strong contender as they had 1 GM and 4 IMs. The Girls were paired to play Algeria. Score today: Male Team 3.5-0.5, Girls Team 3-1. I was still entrusted by the Manager to play again today. One reason was that it wouldn’t make any difference anyhow! As expected, we lost fair and square. I felt sad about my own game. Despite being 1 pawn down, my position on the board was clearly better. Still, as time was running out for me to make move 40 before the first allotted time of 1.30 hours, I made blunders and lost the game eventually. Wisuwat and Uaychai lost their games because their opponents were too good for them. Jirapak surprisingly got a draw with GM Bluvshtein Mark (2583). Hats off to him! Wisutwat’s game was somewhat interesting – his 20-year-old IM opponent, Samsonkin Artiom (2409), sacrificed a rook which earned him very good positional play, leaving Wisuwat hanging onto the ropes throughout the game. As for the Girls, only Nong Da [Worasuda Atthaworadej], the youngest team member, managed to draw her WCM opponent, Abdi Zineb. Results today: Male Team 0.5-3.5. Girls Team 0.5-3. You can view the games here. Thanks for the excellent report, Sawapop. Well done. Cheers for the Thai team! I’m rooting for you every day. 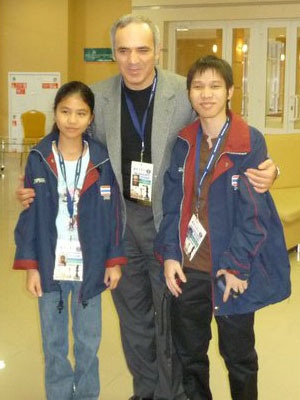 Congratulations to the Thai Women’s Team for being the first ever to the Chess Olympiad.